This is a great miniature and not often is an Ebay score a nicely painted fig unless specifically bought as one. I remember reading a long essay on the inconsistencies of trolls in Tolkiens' works. 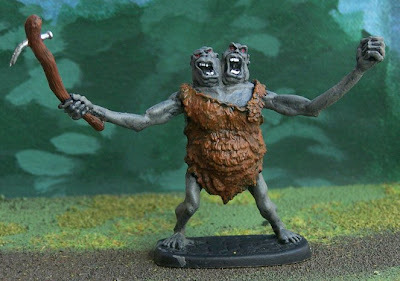 The essay focused on the seemingly "intelligent" trolls wearing clothes and with common human-style names depicted in The Hobbit and the more savage, bestial versions shown later in The Lords of the Rings. I have always loved trolls as fantasy monsters, but tend to go more with the Scandanavian interpretations of their craftiness, wit and cunning.